James Cameron and Tim Murtagh added 58 runs for the 10th wicket for Ireland. The equation in the first Test between Afghanistan and Ireland in Dehradun is pretty simple. The hosts need 118 runs to win the match while the visitors are 9 wickets away. With two more days still left in the game, a result is sure to be out. Both these teams will battle it hard to win their first ever Test match. But at the close of play on day-3, it seems as if Afghanistan are in the driver’s seat. Andrew Balbirnie came to Ireland’s rescue in their second innings with a well-compiled 82. James McCollum and Kevin O’Brien also batted well to help their team set a reasonable target. But the highlight was yet again the 10th wicket partnership for Ireland. While it was 87 in the first innings, the last two batsmen added 58 runs in the second. These efforts helped the visitors set Afghanistan a target of 147 runs. With an overnight score of 22/1, Ireland continued batting on the third day. Skipper William Porterfield was dismissed for a duck on day-2 itself. The hosts didn’t take too long to break the partnership. Paul Stirling was dismissed by Yamin Ahmadzai for 14 runs. After an impressive 82, chinaman bowler Waqar Salamkheil got the better of Andrew Balbirnie. James McCollum, who was involved in a good partnership with Balbirnie got out in the next over after the number three batsman was dismissed. Rashid Khan quickly ran through the middle-order before Kevin O’Brien and George Dockrell dug in and built a good partnership. But the leggie dismissed both of them within a span of six balls. He then claimed the wicket of Andy McBrine to become the first Afghan to pick a 5-wicket haul in Tests. James Cameron and Tim Murtagh provided the bowlers with a tough time. They scored runs at a quick pace and were getting boundaries regularly. Their partnership of 58 helped Ireland go past 250. The side was ultimately bowled out for 288 runs after Ahmadzai picked up the wicket of Murtagh. The Afghan openers tried to play cautious cricket in the final passage of play. But Mohammad Shahzad, after scoring 2 runs off 34 balls was dismissed when just 3 overs were left in the day. After defending a lot of balls, Ihsanullah Janat smashed a few boundaries in the last over as Afghanistan finished with a score of 29/1. Twitterati was flooded with congratulatory messages for Rashid Khan. They also praised Balbirnie and the tail-enders for their efforts. 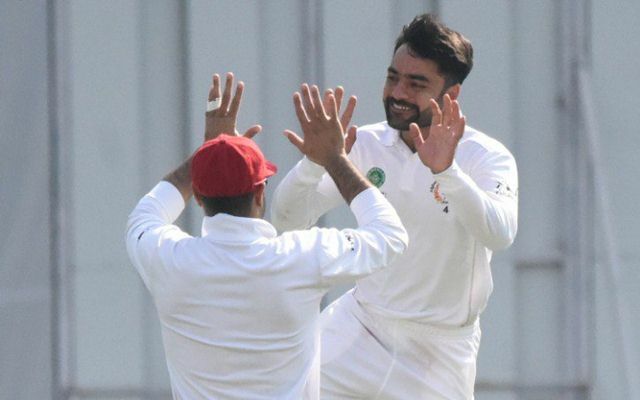 Rashid Khan has his first five-wicket haul in Test cricket! How good is the Afghanistan leg-spinner? This match is totally balanced in all aspects and both teams look totally equal in everything. He's taken 123 ODI wickets for Afghanistan. He's taken 75 T20I wickets for Afghanistan. He's now taken a maiden Test five-fer for Afghanistan. Is Rashid Khan the best bowler in the world right now? Is S Ravi the worst elite umpire in the world right now? Get the latest Cricket News and updates from Afghanistan vs Ireland series, Match Predictions, Fantasy Cricket Tips and lots more on CricTracker.com.